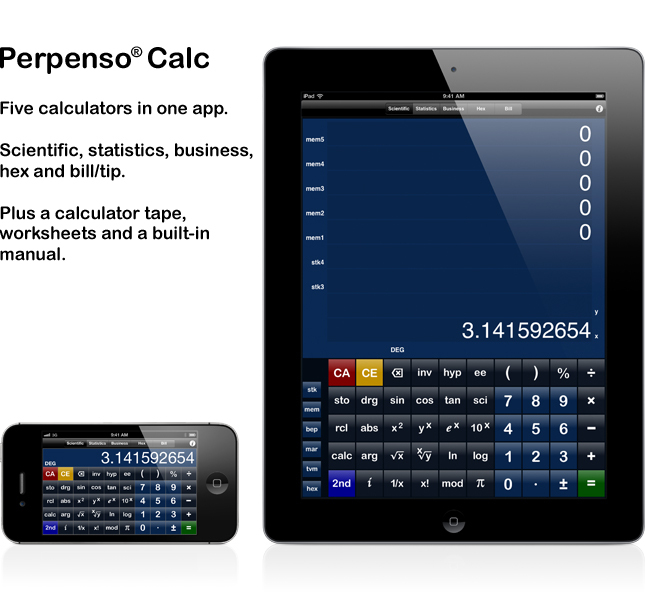 Perpenso® Calc is a calculator application for the Apple iPhone, iPad and iPod touch. It is five calculators in one fully paid app: scientific, statistics, business, hex and bill/tip. All five modes are included. A calculator tape, worksheets and a built-in manual are also included. Perpenso Calc 4 is a related upgradable lite app. Scientific mode is included and the other modes are optional. Perpenso Calc is offered at a discounted price and may cost less than adding all your desired functionality to Perpenso Calc 4. Both versions are feature rich apps that are comparable to traditional handheld scientific, business and hex calculators. Copyright © 2016 Perpenso, LLC. All rights reserved. Perpenso is a registered trademark of Perpenso, LLC, registered in the U.S.
Apple, iPhone, iPod touch, iPad, Retina and App Store are registered trademarks of Apple Inc., registered in the U.S. and other countries.